The exhibit at Cleveland's Burke Lakefront Airport puts women on a pedestal. The pedestal reaches the clouds and far beyond them, even into deepest space. The International Women's Air & Space Museum, a one-of-a-kind in the world, highlights the accomplishments of women who worked in all aspects of aviation and space exploration, regardless of whether those jobs were on the ground. "When I see these woman astronauts and cosmonauts, I am in awe of how many women have been in space," said Marcy Frumker, who is a member of the board of trustees at the museum. She has long had strong interest in aviation, dating back to her childhood. She said she understood the importance of a museum highlighting the accomplishments of women in aviation. Women were there at the very beginning. A sister of the Wright Brothers, who first flew a heavier-than-air craft in 1903, worked with her historic brothers in keeping records and handling various aspects of their business. The museum chronicles what women have done in aerospace circles, including the several dozens of women who have ventured into space through NASA or the Soviet Union-Russian space program. Their photographs are on a wall of the exhibit. "We look at not only the pilots, but also the mechanics, engineers, flight testers and anyone who had anything to do with aviation and aerospace programs," said Heather Alexander, executive director of the museum. "Also, the astronauts, mission controllers, and air traffic controllers," she quickly added. There is even a pair of overalls which were owned by the pioneering pilot of the 1930s, Amelia Earhart. She helped propel women deeper into aviation by her record-setting airplane hops around the world. Earhart attempted an around-the-world flight, but was lost somewhere in the Pacific. Still, her story is told. "Standing here being able to actually see her memorability and hold these coveralls in my hands is quite the moment," said Katie Brinager, an employee of the museum. Inside this section of Burke Lakefront Airport, there are several airplanes or flight trainers. The flight trainers were used during World War II to help military pilots learn how to fly on instruments without ever leaving the ground. Other stories told include those of American women who piloted military aircraft from their places of manufacture to military bases throughout the United States. Some of the women helped train the men who would later fly the same aircraft into battle in Europe, North Africa, the Pacific, and other locations throughout World War II. 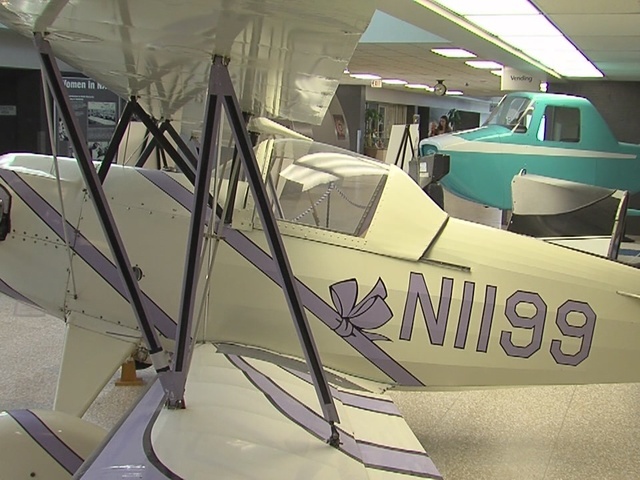 All the people associated with the museum said the exhibits were also places of inspiration, especially for girls and women who might want to give thought to careers in aviation or aerospace programs. The museum is open every day from 8 a.m. to 8 p.m. The gift shop is open Monday through Friday from 9 a.m. to 4 p.m. There is no admissions charge. The museum is located in Burke Lakefront Airport at 1501 North Marginal Road in Cleveland. Its website is www.iwasm.org .